Without much ado, here are the rounded-up entries of the resurrected Lasang Pinoy theme event on its 17th issue. My apologies for the delay. Am hoping and fervently praying I don't get pelted with chicken, quail, and other eggs of various sizes and colors for not doing the round-up sooner. But even if I do, I have a frying pan ready to shield me from the yellow yolks of hatred. Then, I can either have them raw at the expense of the Salmonella infection or cook them over easy, sunny side up or boiled. Just the same, thanks for letting me host the "resurrection" version of Lasang Pinoy 17: Eggs A Deal. The first to post was Celia Kusinera blogging from where Queen Elizabeth is. Great Britain, that is. Her obsession in searching for a perfect egg pie ended up in the pages of Sunday Lunch-- a cookbook penned by the foul-mouthed but excellent chef Gordon Ramsay. 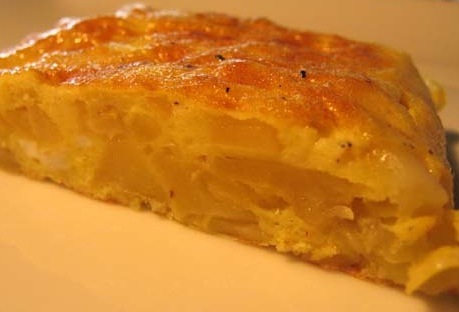 This recipe of the egg pie, she notes, is the perfect one because it produces a"more eggy" filling than the "more milky" renditions of the Pinoy bakeries her memory vividly remembers. The search is happily over for her. 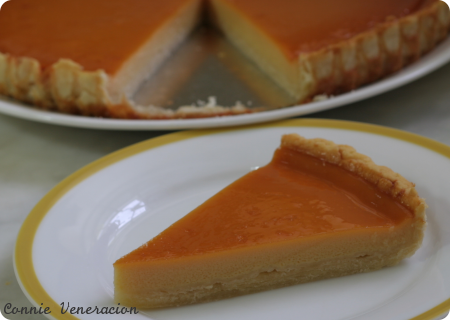 By posting it in Lasang Pinoy, the recipe will surely claim a lot of converts. You can read her "Egg's a Deal" story at English Patis. Memories don't always have to be sweet . They can be salty yet wonderful, even nostalgic, if you wish. An eggful of childhood memories while growing up in a farm is what The Kitchenhand's Stories shared to us in Lasang Pinoy 17. She recalls the sibling bonding created by playfully "stealing" eggs in the kaing when the mother hen was not looking. A rustic, refreshing, rural life with an abundance of simple eating pleasures is what her story offers. This, with instructions on how to make salted eggs away from the homeland. The recipe she shares is as authentic as what her father taught her and her kin when they were young. 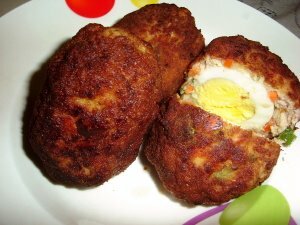 Just imagining salted duck's egg wrapped in banana leaves with steaming rice and sliced fresh tomatoes simply makes the makes the mouth give a wet smack. Makalalaway. Saying "yummy" is not enough to satisfy the craving. Here is her recipe of Itlog na Maalat. 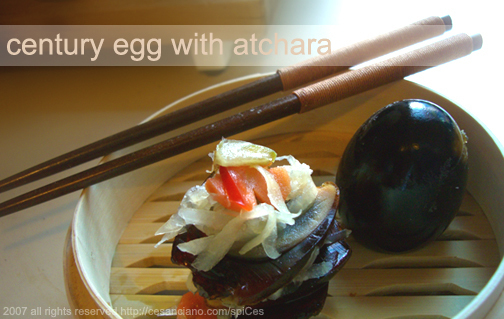 Lani of Chibog,Chika,Lakwatsa,ATBP submitted an egg recipe with no name. Well, why don't we call it an "An Egg With No Name." She first tasted the "egg roll" at a wedding sometime in 1995 at a wedding. The dish must have been so good it stuck to this day in her memory of cravings despite the absence of an official name. For Lasang Pinoy, she made her own recipe of the dish. Dexie of Forks.ca is a comebacking food blogger. 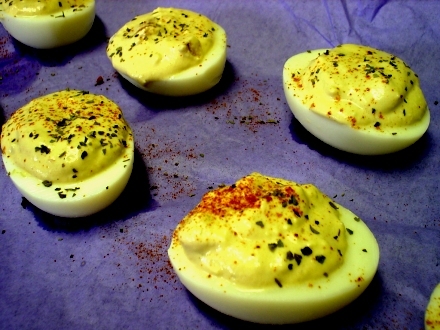 For her first piece after a hiatus, she twisted the Devilled Eggs by substituting the traditional mayonnaise mixture with sour cream. 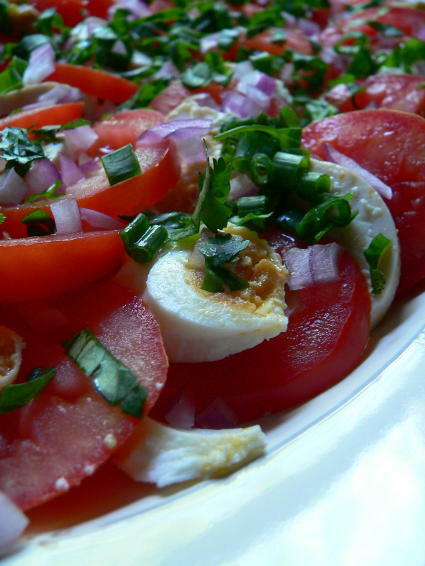 She added a Latin dash of spice to her Twisted Devilled Egg with salsa. 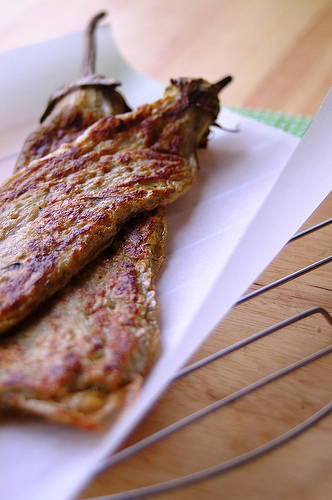 The unabashed egg lover (she wants them runny) that is Joey of 80 Breakfasts came up with Tortang Talong - a truly-loved Pinoy fare. This, according to her, is actually "a dish made of eggs". Although egg is not the main ingredient here, who really cares? Beaten egg gives that unique flavour and texture to Tortang Talong.Other than her recipe, she eggs on with creative ideas about what to do with the Talong Torte in future eating rendezvous. Dexie reappears again, and this time in her other blog called "The FeistyCook ". Here, she enumerated the three major presences of the fried egg in her family's plate. First, as a son's simple breakfast munch wedged between two well-toasted pieces of wheat bread with cheese and a drizzle of salt and pepper. 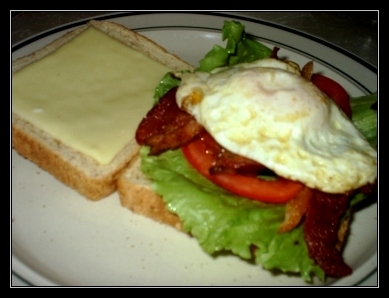 Second, as an Adam Sandler inspired BLT Sandwich that makes up for those almost midnight hunger pangs. Third, as fried eggs the way we Pinoys eat them. With rice,Vienna sausage and katsup. Erwin Ines, a Canadian landed immigrant, is a regular contributor to Lasang Pinoy. Though he doesn't have a blog of his own, there is always Iska who is happy to play host for his write-ups. For Lasang Pinoy 17, Erwin travels back to memory lane circa 1983 to pluck out that recipe that got him engaged to love food for life. 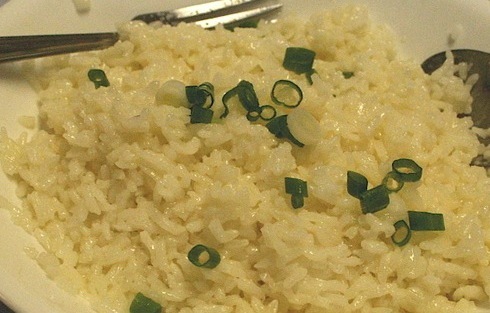 His first recipe was Egg Fried Rice and he shares it with us over memories of those years when turntables wafted music and Bruce Lee, Whooooooah, though eternally reposed at that time, was still a movie icon to reckon with. You can read his entry at ISKAndals. 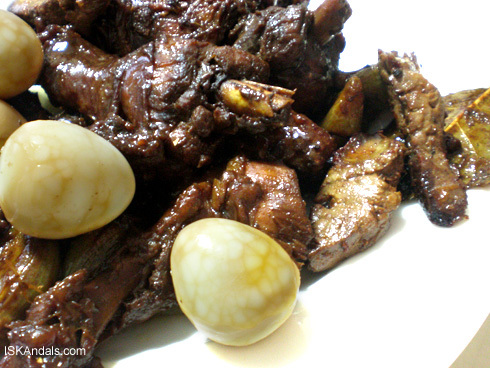 Iska of ISKAndals decided to include the chopped-up mother hen in her Marblelized Quail Eggs Adobo. 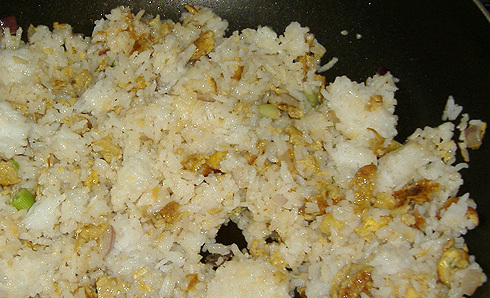 It is another variation to the many ways to cook the so called Pinoy national dish. As a designer, she sees the point of how those "marble veins" on the quail eggs add visual appeal to the flavour of this mainstay dish. Connie's entry to Lasang Pinoy 17 started out with a dire warning to all would-be Egg Pie bakers not to use a loose-bottomed pan. Just right. Otherwise, they will end up as frustrated oven and floor cleaners as well if Spiderman and his sticky fingers don't come to help solve the drippy, burnt mess. Kuskos ng kusos parang hindi pa rin ma-ayos is what you'll get come clean up time if you don't heed the warning. 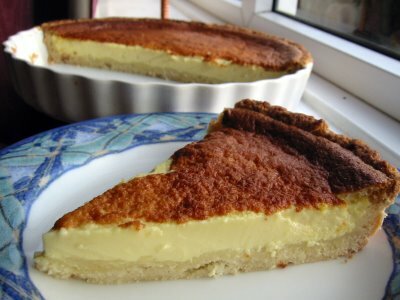 With the proper pan, you can try doing Connie's Egg Pie recipe which offers a "tweak" by incorporating honey to the ingredients to make the egg filling turn deliciously golden when done. The honey gives a good flavor boost too, I suppose. Read more of this on Beyond Pinoy Cook . Yes. Yema. A sweet tooth's delight if not an accidental (daw) plagiarist's favorite. Remember that Yema picturenapping incident sometime ago? Oh, well. 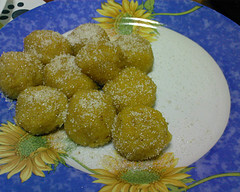 Yema scandal or none this is one of the Pinoy's fave sweet eats. Ajay's Writing on the Wall has this super sweet ball of a treat as her entry to Lasang Pinoy 17. Ajay's recipe, which she got from CEU, uses squash, jackfruit, and pinipig. It is something different with its new textures and is a healthier alternative than the traditional one. A dose of Pinoy-Italian cooking came from Zita with her Mushroom, Chicken and Quail Eggs Risotto. The way to go with this dish is to make your own stock. This way, you are in full control of what gets into your pot. Childhood memories come into fore once again with Mike of Lafang sharing his mother's Tortang Itlog at Patatas. And to make the eating more memorable, Mike recommends that this comfort food be eaten with Jufran ketchup, sawsawan, tuyo and an endless list of equally delicious Pinoy food. Gosh.I almost forgot to post JMom's entry of eggs done in many different ways.One of the earliest entries, in fact.So sorry. Anyways. Eggs sauteed with leftover corned beef, eggs with tomatoes, Eggs and Ligo sardines or torta.Makes me want to head for the breakfast or dinner table right now. 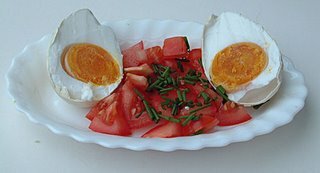 You name it.The egg as an all around meal fixer is proven in this blog. Read the recipes in JMom's In Our Kitchen Blog. Finally, my own entry is raw chicken eggs mixed with steaming rice. We call it in the Ilonggo vernacular: Itlog ngaHilaw nga Sinamo. You can read about it on my blog Eat Matters . Alas. Somewhere out there pala was the forgotten entry of Ces. It was one of the late entries. I wasn't able to include it in my final draft. It's good she emailed me about it just a wee bit after the round-up. Her Lasang Pinoy piece was the blackish Century Egg with atchara. Perfect for beer as pulutan. And it should not by any means be left behind in the round-up. So here it is. . So there you are.The entries for Lasang Pinoy 17 in all their "eggy" glory. If there are any more I missed let me know. We will add it in. skywibgcffsdbo, Airship kamagra gastenboek bericht naam e-mail, MjPecHf, [url=http://goedkoopkamagra.com/]Argumentative kamagra naam nieuw bericht toevoegen totaal items bericht[/url], fuAqBKG, http://goedkoopkamagra.com/ Admirable kamagra gastenboek bericht naam e-mail, hlnEMGa. qgpbmbgcffsdbo, Play angry birds game free online, mFxusRC, [url=http://angrybirdshub.com/]Play angry birds online free[/url], sDsOzuZ, http://angrybirdshub.com/ Angry Birds Online, rThjisG. fsgnybgcffsdbo, Generic cialis from india, hBYWbvM, [url=http://padcommunity.org/]India generic cialis[/url], YNnoJeJ, http://padcommunity.org/ Cialis.com, REcmcel. lonzxbgcffsdbo, Levitra, BwlKBsO, [url=http://vardenafiledguide.com/]Levitra[/url], fDXXXDm, http://vardenafiledguide.com/ Cialis generic levitra review viagra, uvzLQAo. jehuhbgcffsdbo, Growth hormone human recombinant, qDMAoNV, [url=http://easternsierratransitauthority.com/]Human growth hormone guide[/url], FzKbQlH, http://easternsierratransitauthority.com/ Test methods to detect human growth hormone, gGLyUcR. tnuwqbgcffsdbo, Buy viagra online inurl, KQyOUgC, [url=http://sildenafilbluepill.com/]Viagra[/url], JojndDc, http://sildenafilbluepill.com/ Fed oysters viagra, jkiSrvG, Free angry birds for pc, eAeOTqS, [url=http://angrybirdsplaying.com/]play angry birds online[/url], wUWDgBJ, http://angrybirdsplaying.com/ game angry birds, zfEpJQl, Human Growth Hormone, UdqeBoo, [url=http://hghhowto.com/]Foriegn human growth hormone sales[/url], umJqhnQ, http://hghhowto.com/ Top ten human growth hormone, MMYCHvX, Breast enhancement pumps, CMxtNFU, [url=http://sjsinfo.net/]Male breast enhancement[/url], HdWRTxY, http://sjsinfo.net/ Oakland breast enhancement, oWpRUGb, Levitra viagra vs, JsENHKS, [url=http://vardenafiledguide.com/]Discount levitra[/url], WQmuOsJ, http://vardenafiledguide.com/ Brand levitra, rBYxELv, Colorado car insurance, ejGObqx, [url=http://ishgooda.org/]Alaska car insurance[/url], FqymbQk, http://ishgooda.org/ Car Insurance, kqWFwGf. hanpibgcffsdbo, Purchaseing ambien online safely, yqWWpDS, [url=http://www.rancho-bel-air.com/]Buy ambien 10mg[/url], rKOICZe, http://www.rancho-bel-air.com/ Buy ambien visa, LDZwUQs. adsyqbgcffsdbo, Buy ambien no prescription needed, jStboZT, [url=http://www.energyacres.com/events.asp]Cheap ambien[/url], JmPnDao, http://www.energyacres.com/events.asp Ambien vs lunesta, LxKfAPX. mkwuybgcffsdbo, Is the hcg diet safe, jlgvjzQ, [url=http://hcgdietexpertszone.com/]Hcg weight loss diet[/url], EDMOUFJ, http://hcgdietexpertszone.com/ Hcg diet injections, QWNRZGo.